Palladium and Rhodium on Fire, is Platinum Next? Platinum was once the most precious of metals. For decades, it traded at a premium to gold. The other platinum group metals – palladium and rhodium – barely registered on investors’ radar screens. Platinum lost its crown to gold in 2015. It was overtaken by the other PGM metals in recent weeks. Given that platinum, palladium, and rhodium demand is largely driven by automobile manufacturing and the production of catalytic converters, one of these things is likely true; platinum is currently undervalued, or the other two have gotten ahead of themselves. 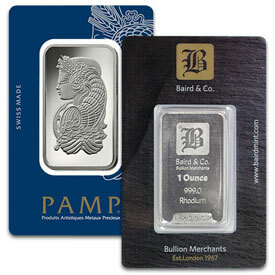 1 oz rhodium bars run about $1,455 each. Which one is the correct assessment will depend on whether the current optimism for economic growth in both developed economies and emerging markets has been well placed. Either way, investors inclined to speculate on the PGM metals have some interesting market action upon which to trade. Platinum does look remarkably underappreciated. It is hard to imagine it trading at a significant discount for too long. Auto makers should bid for whichever metal offers the lowest cost as all three are somewhat interchangeable. Platinum offers the largest and most liquid market of the group. It is widely available in a variety of coins and bars. For investors, platinum’s liquidity is a consideration. However, momentum traders may want to take a look at rhodium. It is traded in relatively tiny quantities and has a history of making big moves. 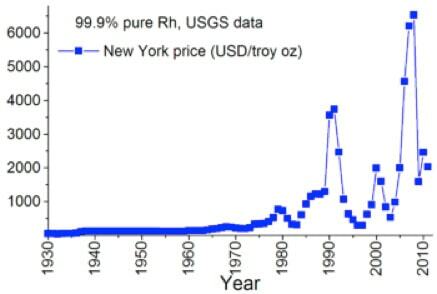 Rhodium saw a top near $4,000 in the early 1990s and it made a run north of $2,000 about 10 years later. It peaked at $10,000 per ounce in 2008. Although rhodium has doubled in the past year, it currently trades just over $1,300. The metal’s pattern of having a sharp spike roughly once every 10 years is interesting. It is possible we are in the middle of another of those massive moves now. Rhodium is available primarily in 1 ounce bars. While the quantity of rhodium traded is by far the lowest among precious metals, market liquidity for that metal has seen a boost since 2008. There are now a couple of ETFs focused on the metal. Those ETFs may in fact be driving a good portion of the recent demand. Editor’s note: The Platinum Group Metal pricing patterns are primarily based on supply/demand fundamentals, not on rarity of the metals in the earth’s crust. Rhodium and palladium are running high as they are both in a substantial supply deficit situation while platinum supply and demand are much closer balanced. Palladium, with a little rhodium, is currently the preferred catalyst for gasoline-powered internal combustion engine emission control catalytic converters, having largely succeeded platinum in this usage, but this was due to palladium being substantially less costly than platinum – that is until palladium’s (and rhodium’s) recent run. The big question now is: is platinum, being the cheaper metal, going to make a dent in palladium’s current predominance as the catalytic metal of choice for gasoline powered engines. It is already the dominant catalytic metal for diesel exhaust emission control. Platinum and palladium outlook – Big deficits ahead but will they make any difference to prices? We have seen three major reports out for London’s Platinum Week from Metals Focus, GFMS and the WPIC. They all offer comprehensive analyses in text, tabular form and graphical content of various aspects of the markets and they are a hugely valuable resource for followers of the pgms sector. There are definite differences of opinion on the relative supply and demand scenarios for platinum in particular in 2015, but all three analyses are predicting supply deficits ahead for the two major pgms, but on past performance such seemingly strong fundamentals may have little impact on prices. The latest to report was Metals Focus with its inaugural Platinum & Palladium Focus 2016, a comprehensive 78 page long analysis of the platinum and palladium markets. In many respects it appears to this observer to offer the most realistic appraisal of the markets and likely price performance for the two major platinum group metals (pgms). Platinum and palladium supply deficits ahead, but will this impact prices? Is platinum in surplus or deficit? Reports contradict.